If you make it through me answering thirty-five questions about books, you might get to win a book. Sound fair? 1. Favourite childhood book? I loved the Whitby Witches trilogy! I also liked Harry Potter an appropriate amount while I was still a child. But seriously, if the Whitby Witches had got as big as Harry Potter the world might be a better place. 2. What are you reading right now? World War Z, Eugene Onegin, and The Real North Korea. I’m quite surprised at just how boring World War Z is. I thought that it was going to be the most exciting book in the world. But some parts of it are beyond dull. 3. What books do you have on request at the library? For some reason I don’t use the library. Although when I was in there collecting by WBN books I did wonder why. Maybe I shall dust off the old library card and go have a look around. 4. Bad book habit? Recently, it’s been reading too many at once and not finishing any of them. 5. What do you currently have checked out at the library? Nothing! Though maybe this will change in the near future. 6. Do you have an e-reader? I have a Kindle. It has not stopped me buying and reading paper books. It has just contributed to my general obsession with buying all the books all the time. 7. Do you prefer to read one book at a time, or several at once? I prefer to read one at a time. Why I cannot seem to do this is quite another question. 8. Have your reading habits changed since starting a blog? Well, yes, but not because of writing my blog. 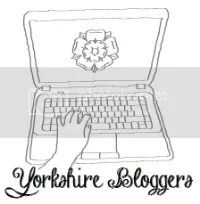 I started this blog while I was an English Literature student so my reading habits were very different then. 9. Least favourite book you read this year (so far?) Bright Young Things by Scarlett Thomas was a huge anticlimax. With or Without You by Domenica Ruta was just badly written self pity. Warm Bodies by Isaac Marion was almost bad enough to be funny, but not quite. 10. Favourite book you’ve read this year? Persepolis by Marjane Satrapi. 11. How often do you read out of your comfort zone? Lately I’ve tried to get out of my reading comfort zone by reading classics and young adult literature. Neither of these experiments went over particularly well. I will go back to the classics soon. Young adult is kind of fun, but overall quite unsatisfying. My WBN choice is actually classed as young adult, so we will have to see how I feel about it! 12. What is your reading comfort zone? Contemporary fiction by British or American authors. So, so boring. 13. Can you read on the bus? Yes. Bus reading is one of my favourites of all the readings. 14. Favourite place to read? The bus! Other forms of public transport are also good. I also like reading in bed. Every now and again I like to be self-indulgent and sit in a café with a book and a hot drink and a pastry, but this is not a regular activity. I do not like to read in the bath as I am too clumsy to avoid dropping the book. 15. What is your policy on book lending? My policy is that I want to lend everyone a book, and very few people want to take one. Let Mrs Doyle illustrate my book-lending policy. 16. Do you ever dog-ear books? Yes. I am not precious about books in any way. I am baffled by people who claim to love literature and reading and yet focus on the physical book rather than the words inside it, the importance of literature, or the act of reading. It’s just a book. On the very rare occasion that I have paid more for a fancier looking book, I might take a bit more care of it, but even then. What does it matter if the book has creased pages and coffee stains? As long as I can still read the words it serves its purpose. I do think that physical books are great, but if you think it is more important to have a pristine book than to enjoy the story and share it with others, I feel that you may be missing the point. 17. Do you ever write in the margins of your books? Not very often now, but at university I obviously did. This was why I regularly ruined my bank balance by buying all the books I needed rather than just using the library – so that I could write all over them with impunity. I also love it when I buy second hand books and find little notes in them. 18. Not even with text books? If it was a text book I owned, I would write all over it. One of my literature anthologies was made of such thin paper that I could only write very delicately with a sharp pencil, or it would tear the pages and copy through. 19. What is your favourite language to read in? English. I don’t know any other languages well enough to read literature. 20. What makes you love a book? I don’t think that there’s a formula. 21. What will inspire you to recommend a book? If I am excited about it. 22. Favourite genre? I’m never entirely certain what constitutes a genre. (I probably shouldn’t admit that.) I like contemporary fiction, I like historical fiction, I like classics (and am trying to like them more). 23. Genre you rarely read (but wish you did?) I may regret saying this, but I would like to try reading some science fiction. 24. Favourite biography? If Persepolis counts as an autobiography, then I loved that! I don’t tend to read a lot of biographies or autobiographies. 25. Have you ever read a self-help book? I just finished reading Happier by Tal Ben-Shahar. It did not make me happier. It made me slightly annoyed and eventually very bored. Other than that they’re not something I spend much of my time consuming. 26. Favourite cookbook? Honestly, I’m not sure I have ever read a cookbook from cover to cover. Why would I need to when the BBC Good Food website exists? 27. Most inspirational book you’ve read this year (fiction or non-fiction)? I can’t say that I have been particularly inspired by anything I’ve read this year. 28. Favourite reading snack? I’m not sure that I regularly eat while reading. One time while reading a very boring book for my uni syllabus I bribed myself with Monster Munch. That was certainly a worthwhile experience. 29. Name a case in which hype ruined your reading experience. This happens far too often. I might have enjoyed We Need To Talk About Kevin a lot more if I hadn’t been made to believe it was the best and most shocking book in the history of ever. I also might have liked it more if it was just a better book, but perhaps that can’t be helped. 30. How often do you agree with critics about a book? Well. I’ve never contemplated this before. I think I agree with critics quite often. 31. How do you feel about giving bad/negative reviews? Honestly, it can be quite fun, especially if there is a lot of undeserved positive hype surrounding the book. If everyone else hates the book then it can sometimes feel quite mean and a bit like piling on, but hey. Bad books need bad reviews. 32. If you could read in a foreign language, which language would you chose? Russian. 33. Most intimidating book you’ve ever read? The Bone People by Keri Hulme seemed quite terrifying before I started it. 34. Most intimidating book you’re too nervous to begin? The Thousand Autumns of Jacob de Zoet by David Mitchell. I read three pages and got scared. It’s still sitting on the shelf staring at me a few years later. 35. Favourite poet? I can’t really answer this. I’m in the middle of one of my annual ‘teach myself to love poetry’ campaigns and it’s still not exactly clicking. There are a few poems I can think of liking off the top of my head: Train by Helen Mackay, Girl by Jamaica Kincaid, and Strange Meeting by Wilfred Owen. Also we must not forget, if they count as poetry, these words to live by from Ogden Nash: I would live all my life in nonchalance and insouciance, Were it not for making a living, which is rather a nouciance. 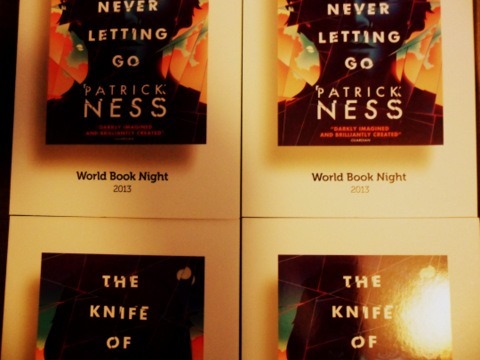 Now, good folks, as your reward for reading all that drivel (or scrolling straight past it if you’re crafty), here is your chance to win a copy of The Knife of Never Letting Go by Patrick Ness. Last year I was lucky enough to be able to give away one of my all-time favourite books, but this year I found that I hadn’t read any of the books listed. The Knife of Never Letting Go was a bit of a blind pick, although it is one I’m very excited about reading! I’m hoping to read and review it in the next few weeks – if the winners of the giveaway are interested, we could do a collaborative review? So, without any further ado, here is what the World Book Night team have to say about this title. Just one month from the birthday that will make him a man, Todd unexpectedly stumbles upon a spot of complete silence. And now he’s going to have to run. Astonishingly powerful and breathtakingly exciting, The Knife of Never Letting Go is an unflinching novel about the dangerous choices of growing up. So would you like to win a copy? All you have to do is leave a comment on this post, telling me why this sounds like the kind of book you would enjoy. Please leave a way that I can contact you – preferably email or Twitter. I will be giving away five copies at first. If I have any left in a couple of weeks time I may run another giveaway via Twitter. At present I am only willing to post within the UK, so please only enter if you have a UK address that I can send the book to. This competition will close at 12 midday GMT on Wednesday 1st May. Books will be posted within seven days. Giveaway closed! Thanks to everyone who entered. I’ll be sorting out the winners soon. I hope the talk was good! I tend to be quite scared of hype as well. I agree with so many of your answers! I also thought World War Z was a bit of a let down considering I love zombies so much. My favorite place to read is on trains or buses! I also buy cookbooks but never use them because there are too many good blogs out there! I’m still feeling disappointed by World War Z. How could it be so dull? Excellent post. I love lending books but I’m nervous to borrow them because I inevitably turn down corners, spill something on it and absentmindedly crack the spine before handing it back to the neat freak I’ve borrowed it from! Young Adult Fiction – try Hold Me Closer Necromancer by Lish McBride and the follow up Necromancing the Stone. Lish is a friend of mine and her books are hilarious. Science fiction – not a big fan of this genre but I loved Under the Skin by Michel Faber. I’d love a copy of The Knife of Never Letting Go because I love to read books that other people have recommended and I’m a big fan of coming of age books set in worlds very different from my own (I Capture the Castle, Brave New World, Hunger Games etc). I’m the same, I feel very nervous around other people’s books, but I don’t mind how books come back to me. Thanks for your recommendations! I’ve read Under the Skin and I really enjoyed it – though it was an ethical mindfuck for me. I’d love to read this book. I’d never heard of it before picking it randomly for my 2nd choice for wbn (1st choice was noughts&crosses, which I got and gave out this evening, to strangers on the street). I love fast paced page turners, and simon mayo on radio2 today said it was his favorite book. This sounds like a really interesting book, and I love finding new authors (to me) I would also love to find out why he has to run, is it just because he has been lied to? ?